Better Together is a book of stories about people who are building communities to solve specific problems. The examples Putnam and Feldstein describe span the country from big cities such as Philadelphia, San Francisco, and Chicago to the Los Angeles suburbs, small Mississippi and Wisconsin towns, and quiet rural areas. The projects range from the strictly local to that of the men and women of UPS, who cover the nation. This book takes us into Catherine Flannery's Roxbury, Massachusetts, living room, a UPS loading dock in Greensboro, North Carolina, a Philadelphia classroom, the Portsmouth, New Hampshire, naval shipyard, and a Bay Area Website. The Hartford Courant If Bowling Alone made readers think, perhaps Better Together will make them act. 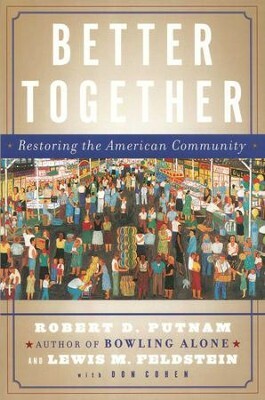 I'm the author/artist and I want to review Better Together: Restoring the American Community - eBook.